National Day Celebration at Ftpss.. this gonna be a long post.. so pls go toilet again b4 reading it!! parade will always start with a water parade!! and that's the time when all the UG start to challenge with each other with the water parade cheer!! wahaha!! 3 Old Bird.. they named it themself!! haha!! 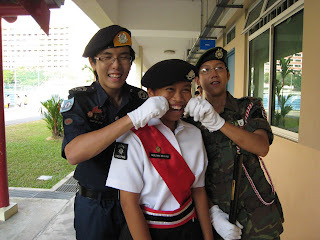 the NCC sec4 final and last parade!! hooray!! is this a class photo or?? my squad 1 to squad 3.. plus 3 senior..
1st time i see informal shot is so "ROBOT" de.. wahaha!! are they doing "soonba" or z3 sign?? this then is informal shot!!! wahaha!! the 3 best friends!! after the whole parade!!!! Ihsan!!! one of my NCO!!! haha!! let's dump him!! mUhahahahha!!! btw, i was pulled by my cadets for 30 minutes plus to played this!!! coz they wan to dump me!!! in the end i escape!!!! wahahaahah!!!! oh my!!! cadets attack advisor!!! Candy floss!!! the kids fave!! my dearest!!!! haha.. bought 3 cute little things frm them!!! haha!! Mdm Sri!!! my dearest SJ T.I.C!!!! so pretty!!! guys dont drool... coz she's married!! haha!! wow... illegal gathering inside the room!!! wahahaha!! while Mrs Lai went in and check on them.. oOps!! look clearly at the door!! haha!! oh my!! Han Lun frm MFSS!!! got a shock when i see him.. ask him y he here.. den he tell mi is Weisheng frm NCC invite him here de.. hahaha.. wow.. so fast built up friendship le ah.. lOl..
that's the time when the fun come!!! look out for more fun photos!! haha!! liyana!!! siao ah u!!!!! hahahaha!!! ae ae ae!!! i'm jealous!!! haha!! feeding 1?? the exciting part is coming up soon!! 2nd target Yang Chung!!! btw, wat is brandon expression for??? Mrs Gratez!!! my 2nd SJ T.I.C!! promoting her best friend!!! hahahaa!! Angel!!! my dearest xiaogua!!! haha!! Our StJohn cadets nnew hobbies!!! hahaa!!! inside the room having havoc!!! while waiting for the cadets to dismiss by principal!!! hahaa!! as usual.. off we go to Fork n Spoon!!! 14 of us!! haha!! me and my xiaogua!!! my daughter!! haha!! is yongsiang trying to sing song for yeening??? whahahaaha!! the kids gone havoc again!!! wahahahahah!! b4 the readers start to get bored.. ok.. i end my post with this pic!!! wahahaah!!! time to go toilet again!!! mUhahahah!! i wan to be a cadet!!! cadets life is much more FUN!! !